Get Wrapped - Get Seen - Get Sales! Our Wrap Star at Big Star Branding! Why spend big bucks for 30 seconds on the radio or television for an ad that will be forgotten? Even a highway billboard can be costly on a month to month basis and is only effective for that immediate area. Vehicle wraps have emerged as the most effective, most affordable type of advertising when compared to other traditional sorts. They allow you to turn y our car, truck, van, or trailer into a Moving Billboard for your business. Imagine everywhere you go being able to advertise with an eye-catching design and detailed message. The cost per impression for advertising like this would normally consume your budget; however, vehicle wraps give brand exposure to thousands of potential customers, whether you're driving on the highway or parked in areas with heavy foot traffic. Vehicle wraps and vinyl advertising can cost anywhere from $5 - 11 dollars a square foot and can last up to five years. This means that your cost of impression is pennies. At that rate, how can you afford not to get wrapped? Do you need a quote today? Send in your quote or call us today! According to studies from the Traffic Audit Bureau for Media Measurement (TAB), a vehicle wrap can generate 30,000 to 70,000 views per day. Applied wraps typically last three to five years, allowing you to get the most for your investment. A wrap can help preserve a vehicle's finish without hurting the resale value. Some customers even purchase one–color wraps in lieu of repainting their vehicles. Get the full benefits of advertising your business without sharing space with other advertisers (as you would with promotional mailers or rotating billboards). You'll have no competition with other businesses to advertise in prime locations. Mobile advertising becomes increasingly more valuable for companies that put vehicles on the road frequently (such as delivery services or bus companies). 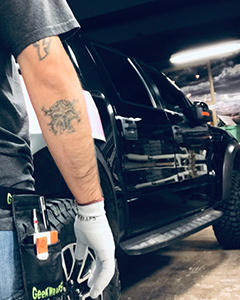 Each vehicle wrap installation requires an up–front, non–refundable investment that can seem costly; however be sure to compare it against your return and weigh the benefits of the potential value. Although vinyl manufacturers guarantee the material for 5 to 10 years, the actual life span of a vehicle wrap will be considerably less. In addition, wraps that stay on vehicles longer than three years tend to bond more strongly to the surface and will make wrap removal more time–consuming. Wraps adhere best to vehicles with factory–finish paint jobs and no major damage. Vinyl won't stick to repainted vehicles, and significant dents or other exterior damage on a vehicle increases the potential for unsightly wrinkling, lifting, and bubbling. There is no clear–cut way to measure vehicle wrap performance. You may be able to look at basic statistics, like local highway or foot traffic data, but that won't provide specific information about how your wrap performs. Visit our Flickr Gallery for more samples! Vehicle wraps are color digital prints that are affixed to autos, vans, trucks, trailers, RVs, buses, and boats. They are more vivid and eye-catching than traditional cut vinyl letters. Color digital printing technology allows businesses to put virtually any image on vehicles including photos, logos, and text. It is applied directly over the original paint of the vehicle. Anything less than a full wrap is normally called a "partial wrap." How long will vehicle wraps last? Typically you can leave a wrap on between four and six years. The life of your wrap depends on many factors such as care and treatment of your vehicle. In most cases vehicle wraps will not damage factory paint jobs. It actually protects the paint from scratches. The majority of the process time is spent in the design phase where we will develop the concept that you have for your wrap. The length in time will depend on whether you have a clear idea of how you want your wrap to look. After that comes the production and installation stage. It usually takes 5 – 10 days for the whole process to be complete. If my vehicle wrap graphics are damaged, can they be fixed? Yes. You can normally have the damaged pieces replaced. Depending upon the damage, you may not have to replace the entire design. Hand washing is best. Try to avoid high pressure washes and be careful never to use an ice scrapper on window graphics. Can I see through the vinyl on the windows? You can see through window graphics that are printed on perforated window film. Window perf vinyl is perforated with very small holes that allow you to see out. On a full wrap it is normal to have an occasional wrinkle or bubble. There are many techniques to reduce wrinkles and bubbles when wrapping, but even the best wrappers can't eliminate all wrinkles. Every wrap has its own set variables that will determine the cost. We cannot quote a price until we know more about the type of vehicle and the size wrap you are wanting. Do you have more than one car or need a fleet to be wrapped? Custom Vehicle Wrap to advertise while you drive! Make an impression and give brand exposure to thousands of potential customers. Please fill out the form below for a quote.